Things had started on a positive note for all three riders in the timed qualifiers, however, with Goerke recording third, Nicoletti fourth and Epstein seventh. The Rockstar athletes stayed on the pace, with favourable results in their heat races. Nicoletti started in second place in Heat 1 and finished there. He stayed close to leader Cole Thompson for part of the race as the two distanced themselves from third-place running Tyler Medaglia. Riding conservatively for the remainder of the heat, Nicoletti invested his time scouting lines for the main event. Something that would pay off in the end. Goerke and Epstein found themselves gating together for Heat 2. Goerke nailed a third-place start and quickly moved into second behind Colton Facciotti, who had already put some real estate between himself and the chase group. Goerke put the power of his YZ450F to good use and within a few laps caught up to Facciotti. He set the 2018 MX champ up for a pass in the big whoops section and then just rode a steady and smart race to the end. Goerke also logged the fastest time in the two qualifiers, which gave him first gate pick for main event. Epstein, meanwhile, started the heat in fourth place and remained there until the checkered flag. Nicoletti pulled a rocket holeshot on his DASA YZ450F, with Thompson and Goerke close behind him. The New Yorker ruled the track for about seven laps. Around that time Goerke was setting Thompson up for a pass when he clipped a tough block, which sent him into a violent crash. Fortunately, he was able to walk away but the race was over for the Florida native. A lap or so later Thompson made a pass on Nicoletti, who was starting to wear down from the broken ribs injury he sustained a week earlier in Montreal. Facciotti, who had taken over third place, after Goerke’s crash, was also able to get by Nicoletti before the end of the race. Nicoletti was able to hold onto third place, however, finishing just ahead of Cody Vanbuskirk and Tyler Medaglia. Epstein, who started the main inside the top-10, moved up a few positions and managed to cross the finish line in sixth place. The California native is still looking to find his groove and ride at full potential to break into the top-three. “Considering that Phil was riding hurt, he pulled off a great finish and certainly proved his mettle. Lap times for the top five guys were very close all day and the racing top-notch. Matt was definitely looking at a top-three finish in the main, if not the win, but it just wasn’t in the cards for him. With two events left, anything is still possible for Matt, Phil and Dillan,” said team manager Steve Simms. 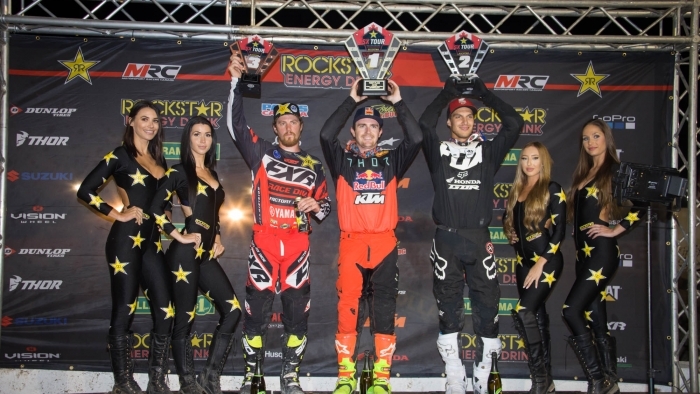 The Rockstar Energy Triple Crown Series continues after a five-week break on Saturday, November 3rd, with Round 3 of the SX Tour at the Videotron Centre in Quebec City, QC.